Meet our new finger puppets... Scrocky, Ruby, Whitetail, and Feathered Bird. The names are courtesy of my 5 year old who had a blast doing this project with me. It's as easy as it looks, but before I get into it... first, the book! You can't really tell from this small image of the cover - and my copy hasn't arrived from Amazon yet, so I couldn't take a picture - but the illustrations in this book are a-dor-a-ble! The book is a sequel to Wonder Bear which I have yet to read (darn you, public library!) but I'm guessing it's every bit as cute. Bunny Days actually contains three stories, each of which play off this theme: bunnies get into some sort of trouble when Mr. or Mrs. Goat come around, leaving Bear to put everything right. My favorite story involves the bunnies' tails getting snipped off and Bear trying to sew them back on. The narration of the book takes a back seat to the wonderful illustrations. I mean, c'mon, who doesn't love a drawing of a bunch of bunnies hanging from a clothesline? The designer in me did a little squeal at each page, and the kid in me loved the quirky stories about bunnies getting sucked into vacuum cleaners or tossed into washing machines. I can't wait to give this to E in her Easter basket! 1. Wrap a pipe cleaner - I think the term "fuzzy stick," while probably more accurate, sounds ridiculous - around your or your child's finger. Do it tightly. E was a little concerned when the tip of her finger turned purple, but was otherwise a good sport. 2. 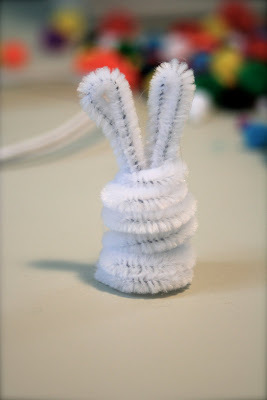 Out of another pipe cleaner, make an M shape, forming two bunny ears. Snip off the extra. 3. Stick the ears just inside the coiled body and secure with a dab of hot glue inside. Be careful not to add too much or there won't be room for fingers. 4. Hot glue a puff ball in front of the ears for the head. I used craft glue (so E could help me) to attach the googly eyes and small puff ball nose. 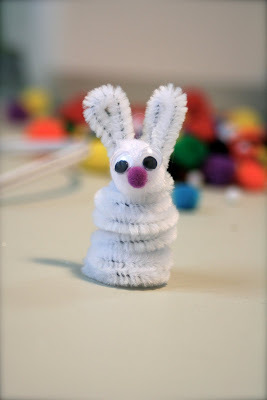 We created two bunnies and then experimented with some chicks. There is still an abundance of stray feathers floating around the house from E's birthday party, so I glued one on the head and added looped pipe cleaners for wings. Now you're ready for your miniature puppet show! Oh. My. Goodness. I love these they are ADORABLE! These are so cute! We'll have to look for this book. These are really cute!!! I love them. Oh, what a wonderful idea, and thanks for such a detailed explanation. Craftless people like myself need them. Those puppets are super cute - I bookmarked your post as something to do soon. Cute puppets!!! I am now following your blog. Simply splendid, as always! Pipe cleaners are a must in the craft drawer! So many ways to use them. My daughter likes making butterflies. When I arrived at your post just now I gasped in delight - that photo at the top is super! 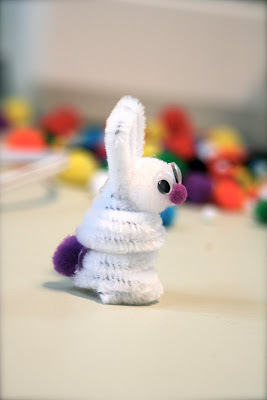 Your finger puppets look absolutely delightful - how great to have such a simple but brilliant project. I shall be trying them out myself with my own two for sure. The puppets are so wonderful! These are very cute and my kids would have all kinds of fun putting them together! Thanks for linking to Show and Tell! What a lovely idea - my girls will love them. Love these! So cute! Going to pin them on my Kiddies Crafts board on pinterest!